Because you're not really one of the "who's who" in Hong Kong unless you're a member of a private club. In no particular order, here are 10 clubs in the city where membership is the most coveted. You don’t have to be American to join this club, but it sure does help. Think burgers and apple pie, Thanksgiving and sports bars–whatever it is you’re missing from the good ol' US of A, you’ll find it at the club's two locations. The Town Club, right in the heart of Central, is the perfect place to indulge in some adult time with top-class restaurants and a fitness centre, while the country club in Tai Tam has something for everyone including a spa, swimming pool, basketball court, tennis and squash courts. The American connection: The club prides itself on its close relationship with other American organisations such as the American Chamber of Commerce, American Women’s Association and the United States Consulate General. Wine and dine: The Town Club boasts five venues including elegant restaurant The Clipper, a steakhouse and a sports bar. Private dining rooms are also available on request. The Country Club offers relaxed venues including a café, wine bar, terrace dining and a poolside grill. For the family: Make use of the sports bar with family zone and den at the Town Club or the “Eagle’s Nest” at the Country Club, a 10,000 square-foot play space. The Country Club is also home to Chill & Joe's teen hangout with big screen TVs, game systems, pool tables and more. There are also plenty of family events including an Independence Day picnic, Superbowl breakfast and Halloween haunted house to name a few. Joining & Membership Fee: The waiting list is around one and a half years and applicants must be proposed and seconded by two active voting members of 12 months standing. A number of different memberships are available. If you're an American citizen, an American Individual Membership is HK$438,000, with monthly fees of HK$2,570. A Transferable American Individual Membership is HK$250,000 with monthly fees of HK$1,950. Finally, there's also a One-Year Temporary Membership at HK$45,600 with monthly fees of HK$1,950, and a Debenture Membership is also available via an agent. Tatler Tip: Keep an eye out for The Holiday Bazaar, hosted here in the lead-up to Christmas, for unique, luxury gifts. If you’re looking for that "wow" factor, you’ll find it here at one of Hong Kong’s most well-equipped clubs. AMC boasts seven restaurants, separate kids’ play zones, indoor and outdoor swimming pools, a bowling alley, fitness centre, a hair and beauty salon and an ice rink, to name a few. Managed by the Shangri-La group, you’ll find the same attention detail as you would in their hotels, keeping you in the lap of luxury throughout. And, as if that wasn’t enough, there’s also fully serviced marina to park your superyacht. Wine and dine: Feast on signature dry-aged and wet-aged meat cuts at the Marina Grill before heading to the adjacent bar, where mixologist Matthew Lau will prepare a cocktail tailored to your tastes. There's also The Deck with views over the marina, The Horizon Chinese restaurant, Caffe Luna Italian restaurant and LaCave wine bar. For the family: Take the little ones up to “Kids on 8!” for an interactive area of mini-worlds, and keep the older ones busy in the two-level indoor playroom with climbing challenges and vertical drop slides. Teenagers have their own Chill Zone and a special graffiti-sprayed lounge area, The Yard. Joining & Membership Fee: While there's no waiting list and hopeful applicants can submit a letter of application, membership is strictly by invitation only. You’ll be paying upwards of HK$3,000,000 on the second-hand market. Tatler Tip: Facilities may be amazing here, but don’t think the charges stop once you’ve paid your monthlies; many rooms are subject to extra daily charges. If you haven’t walked barefoot across the Country Club’s manicured lawn, you’re missing out on a quintessential Hong Kong experience. Founded in the 1960s, this club makes the most of its Southside location with stunning views over Deep Water Bay. It has plenty of facilities to keep you and your little rascals busy, including tennis and squash courts, a bowling alley, health centre, swimming pool and some truly divine restaurants. Fun fact: This is the club where former French consul general, Marc Fonbaustier, was expelled in 2010 for stealing two bottles of wine. Wine and dine: The club has both a Chinese and French-inspired restaurant as well as outdoor Italian dining on the Foreshore Deck and the Garden Room, which serves international cuisine. For the family: The club has an adventure playground with wooden climbing frames set right next to the lawn, where they can run to their heart’s desire. There’s also an indoor playroom with a full-time supervisor. The littlest members are catered for with events including “Funtastic Sunday,” featuring bouncy castles on the lawn. Joining & Membership Fee: The waiting list is upwards of 10 years, and applications are assessed according to a strict nationality quota to ensure the organisation's diversity. Expect an individual membership to set you back HK$460,000, while a corporate membership is HK$5,000,000. Monthly fees are HK$2,500. Tatler Tip: Young sportsmen and women (aged 16-28) may be able to sidestep the hefty entrance fees by applying for a Junior Sports membership, which costs a one-off fee of $200 plus $200 per month after that. If you can bear to leave the city for a day, you won’t regret it once you see this charming and relaxed club set at the tip of the Clearwater Bay peninsula. If you want to get your golf on, head to the golf club’s spectacular 18-hole course. Wine and dine: Work up an appetite with squash, tennis or a workout in the gym (followed by a steam, sauna and massage, of course). Then sip on champagne at the Oasis café as you look out over the enormous pool with uninterrupted views of picturesque coastlines. There are two dining options available at the country club—Ocean View for Chinese cuisine and dim sum, and Oasis Café for international fare. Horizons at the golf club serves breakfast, lunch and snacks. For the family: The country club has a great indoor playroom and two outdoor playgrounds. There are also various family activities arranged throughout the year, including a camping trip on the property and a pool party every summer. Joining & Membership Fee: Members must be recommended by a proposer and a seconder, attend an interview and be approved by the committee. The waiting list is around two years. Individual fees for the Country Club are HK$880,000 while corporate fees are HK$1,320,000, each with monthly fees of HK$1,600. Individual fees for the Golf and Country Club are HK$4,200,000, while corporate fees are HK$6,300,000 and monthly fees are HK$2,600. Tatler Tip: We heard through the grapevine that the club is planning a major renovation to include a speciality coffee shop and infinity pool. Forget watching the races from the public stands. Once you’re a member here, you’ll have access to plenty of exclusive venues from which to bet, including restaurants, bars and even a rocking lounge with its own private terrace. Take advantage of the three fully-equipped clubhouses with indoor and outdoor swimming pools, sports complexes, children’s play areas and more. Wine and dine: Between the three clubhouses and the two racecourses, you won’t run out of dining options. There are 10 restaurants serving an array of cuisines, plus bars, buffet dining halls and outdoor dining venues. If you’ve still got the energy, head over to Adrenaline bar and lounge in Happy Valley, which is open until midnight. For the family: All three clubhouses boast fantastic amenities including swimming pools, outdoor areas and playrooms. There are also plenty of horsey activities including riding lessons and the opportunity to adopt and care for the ponies as part of the newly introduced "Fun with Ponies" programme. Joining & Membership Fee: Anyone can apply to be a member, but corporate membership is by invitation only. Racing members must be voted in and seconded by a resident honorary steward, honorary voting member or voting member of the club. A second resident of the same plus three other members must support your application. Racing members pay HK$125,000 with monthly fees of HK$650, while full memberships are $HK500,000. Corporate memberships range from HK$2,200,000 to HK$4,400,000 with monthly fees of HK$2,200. Tatler Tip: If you’re after the best view of the finish line you’ll need to befriend a HKJC Priority Black and Gold member to dine on the ultra-exclusive private balcony. Slip on your Sperry’s and sling your jacket over your shoulder—this is the place to be for yachties and rowers alike. At each of the club’s three waterfront locations, you can enhance your skills with a variety of courses or rent the club’s dinghies at your leisure. Once you are back on dry land, schmooze with like-minded individuals as you sip on specially curated and subsidised wines. There are plenty of other facilities for landlubbers too, including restaurants, a bowling alley, gym, pool and squash courts. Wine and dine: There are an array of dining establishments, including fine dining at the Compass Room, casual coffee shop fare, a bar and deck, and BBQ and a-la-carte dining at Middle Island and Shelter Cove. For the family: This is a great place to encourage your mini-me’s love of the water with fantastic courses starting from the age of 6. Little non-sailors have been kept in mind throughout each location too, with playrooms, playgrounds, pool parties, board games and other fun things for them to do. Joining and Membership Fee: For the cheapest fees, you’ll need to prove your experience in sailing or rowing and show your willingness to participate in activities with the club. For ordinary membership, you’ll need a proposer from the club. Expect to wait between two to six weeks. An ordinary single membership is HK$91,800 while an ordinary married couple membership is HK$137,700. There's also an individual debenture membership at HK$1,875,000 and corporate nominee membership at HK2,250,000. Monthly fees range from HK$2,000 to HK $4,260. Tatler Tip: Pull an all-nighter at the lavish Regatta Ball. Time will fly as you enjoy endless champagne, the finest delicacies and live entertainment. If you’re still standing at 7am, paste on a smile for the infamous "Survivors’ Photo". If you’re not at home in sports gear, this probably isn’t the club for you. Most members are here to take advantage of the fantastic collection of indoor and outdoor facilities first and socialise later. Set in the heart of Happy Valley, this club has Hong Kong’s largest collection of pitches and grounds including football, rugby, netball and hockey, as well as a swimming pool, bowling alley, snooker room, golf simulator and fitness centre. Wine and dine: With sport being at the forefront here, there are adult and family bars showing a range of games on television. The Sportsman’s bar is the place for beer drinkers with 12 taps of draught and pub-style meals served inside or on the terrace, while the Chairman’s bar provides a more formal setting. There’s also a coffee shop for casual meals and a fine dining restaurant with a weekly set menu and a comprehensive wine list. For the family: There’s a lot going on here for even the littlest sportsman, with classes and teams running for all ages, as well as a ten-pin bowling complex and two children’s playrooms. The Christmas fete has seasonal arts and crafts and games for the kids, with music and entertainment and a bar for parents. Joining & Membership Fee: Sports members are popular here. If you can pass trials and prove your commitment you could be in within a few weeks. Membership is open to all Hong Kong residents. Non-sports preferred members can expect to pay HK$400,000, while sports preferred members pay HK$25,000. Corporate fees are HK$2,400,000, while monthly fees are HK$1,525. Tatler Tip: Members can book the club’s box at the Happy Valley racecourse, which includes a buffet with unlimited drinks. If it’s classic elegance you’re after, look no further than The China Club. Opened in 1991 by the inimitable late David Tang, the décor is pure 1930s Shanghai, filled with art and antiquities from the era. The attention to detail here is striking—from the art-deco sweeping staircase to the Bosendorfer grand piano in the corner of the dining room, you’d be forgiven for forgetting you’re in the middle of one of the world’s most bustling cities. Culture club: The club boasts a mahjong room and a library with an extensive collection of books on China and the Chinese people, not to mention striking views over our great city. Wine and dine: The main dining room on the 13th floor prides itself on its authentic Chinese cuisine, or you can simply while away your evening drinking at the ultra-luxe Long Bar. There are also plenty of rooms dedicated to private dining with banqueting menus available to suit every taste. While little ones are welcome at this club, we suggest you leave them at home to avoid any unwanted accidents with the expensive artworks. Joining & Membership Fee: To join, simply fill in the entry form from the club and you’re good to go. Membership fees range from HK$120,000-$150,000. Tatler Tip: Impress your out-of-town guests with the tea pouring and noodle-making show at dinner. The China Club Hong Kong, 13-15/F, The Old Bank of China Building, Bank Street, Central. This is a must for any golfer worth his salt in Hong Kong. Set on the south side of the island across from Deep Water Bay, the stunning nine-hole par 56 course takes up a large piece of prime real estate and has the price tag to match. The club prides itself on nurturing local talent, and has many high-profile members including the up-and-coming Tuen-Mun born Tiffany Chan. If you fancy a bit of a time out, get hit the gym for a Body Torque Asia personal training session or relax in the secluded walled-in swimming pool. Be sure to head to the sauna to ease those muscles afterwards. 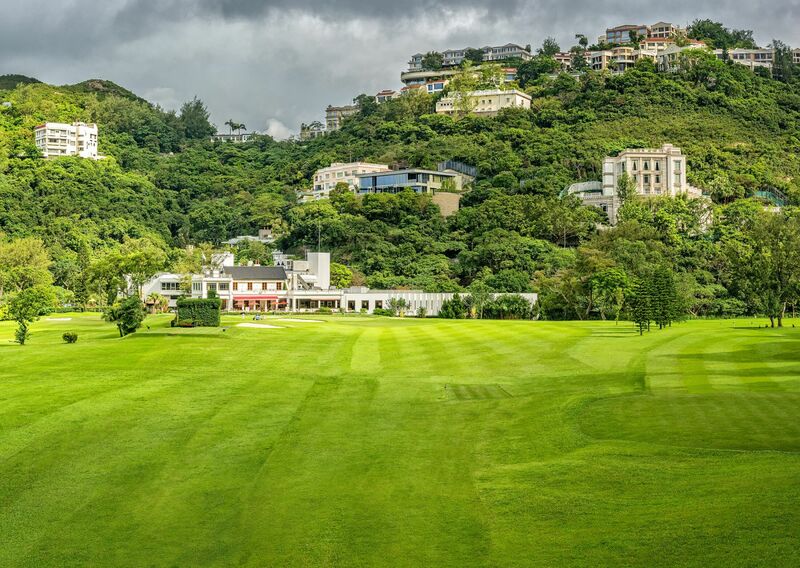 The club’s other site in Fanling boasts three additional 18-hole courses. Wine and dine: Enjoy Cantonese BBQ and dim sum at The Pavilion, or sample international delights at The Fairway Grill. For more laidback dining head to the verandah and bar or, at the other end of the scale, hold a banquet for up to 115 guests at The Orchid Room overlooking the golf course. For the family: Promotions for Father’s Day and Mother’s Day are popular, as is the Family BBQ by the pool, which includes inflatables for the little ones. Joining & Membership Fee: There’s been no opportunity to join this club for a while now. Don’t give up though, as they do occasionally issue a limited number of new memberships. A second-hand membership will set you back around HK$17 million. Tatler Tip: Linger long into the evening with the club’s choice of four International whiskey tasting trays. You’ll know you’ve made it if you get to call this your home away from home. Founded in 1846 and full of old world charm and elegant colonial décor, it harks back to an era when only men would meet to quaff whiskey and discuss business. Thankfully, it has moved on from the days when women weren’t allowed, but exclusivity is still key. Known simply as “The Club” to its members, its current Central location houses 25 floors of incredible leisure and fitness facilities including restaurants, squash courts, a bowling alley, a billiards room, a fantastic library and even its own barber. Wine and dine: Two restaurants and three bars serving everything from light lunch and snacks to Chinese and Western fine dining. There’s also a selection of private function rooms and a garden lounge. You wouldn’t want to look out of place here, so make sure you check the website for the club’s extensive dress codes. No photos: Memories of your days here are for your eyes only, as no photography is allowed anywhere in the club. Joining & Membership Fee: Shhh—we don’t talk money here, darling. Tatler Tip: Channel your inner Downtown Abbey with post-dinner card games for gentlemen and a separate reading room for the ladies.